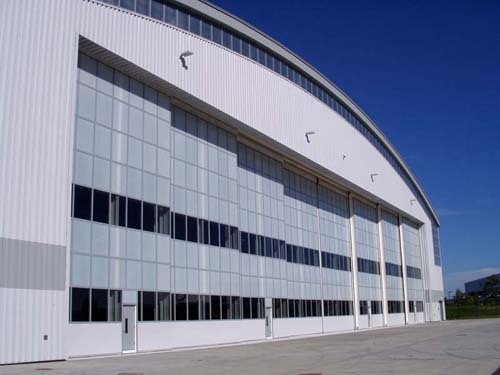 EXTECH’s translucent wall, skylight, canopy, and industrial window systems have helped improve industrial facilities throughout the United States and Canada. Our systems offer a host of benefits for manufacturing, warehouse, technology, storage, and distribution facilities. They can be customized to meet the specific demands of your environment and can be fully fabricated to allow for rapid installation. EXTECH’s TECHVENT 5300 has helped many industrial applications maximize air flow, achieve outstanding energy efficiency, and harness natural daylighting. 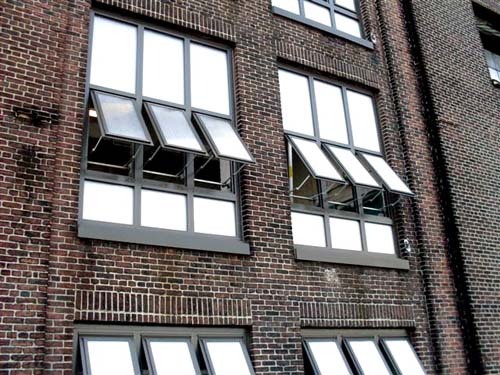 This top-hinged industrial window system was designed to remain open during normal rainfall so it can provide ventilation regardless of exterior weather conditions. The TECHVENT 5300 can be installed in an individual punched opening or in continuous “wings” of up to 150 feet. These industrial windows can be operated with optional manual or electronic control systems. The TECHVENT system has been in continuous use for over 40 years, and is favored in applications that require the extreme durability of polycarbonate glazing, including food processing facilities that cannot risk the threat of broken glass. TECHVENT is useful in data centers that must accommodate high cooling demands, while meeting stringent sustainability standards. 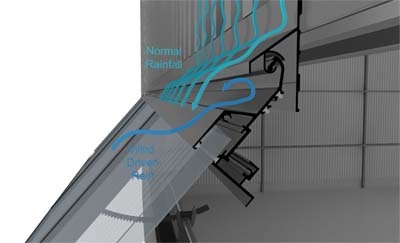 Often the motorized control system is coupled with the building’s HVAC system, allowing the windows to provide ventilation on-demand as the HVAC system requires it. In this way, the TECHVENT 5300 can assist in achieving optimal Power Usage Effectiveness (see below case study: Data Center for a Leading Global Technology Provider for more details). Of course, this massive ventilation of TECHVENT also helps with indoor air quality and meeting occupational health, safety, and welfare standards. EXTECH’s translucent wall systems offer the impact-resistance and durability needed for manufacturing and warehouse environments. These cellular polycarbonate glazing systems are up to 250 times more impact-resistant than glass, while offering up to 4 times the insulating value. Our LIGHTWALL line of vertical daylighting systems are designed and tested to endure high wind velocities and windborne debris. Systems are available to meet ASTEM E1996 Large missile impact testing at up to 8’ spans. Our LIGHTWALL 3440 utilizes 40mm (about 1 ¼”) thick interlocking panels that have superior insulating value when compared to glass. The superior insulating value (R4+) of this system lends itself to daylighting for refrigerated facilities such as meat packing plants, refrigerated distribution centers, and food processing facilities. Our LIGHTWALL 3100LS was specifically designed for the 150-acre ThyssenKrupp Steel Mill, and thus it offers long spans with minimal structural support required. The LIGHTWALL 3100LS’s internal gasketed water stops and low friction gasketing deliver a long term system performance. Our LIGHTWALL 3000 is designed to incorporate polycarbonate, glass and metal panels all within the same glazing channel – one of the few systems in the world that does. One common industrial application of the 3000 system is large moveable warehouse doors, which require structural support and the incorporation of aluminum composite panels, vision glass and translucent material. 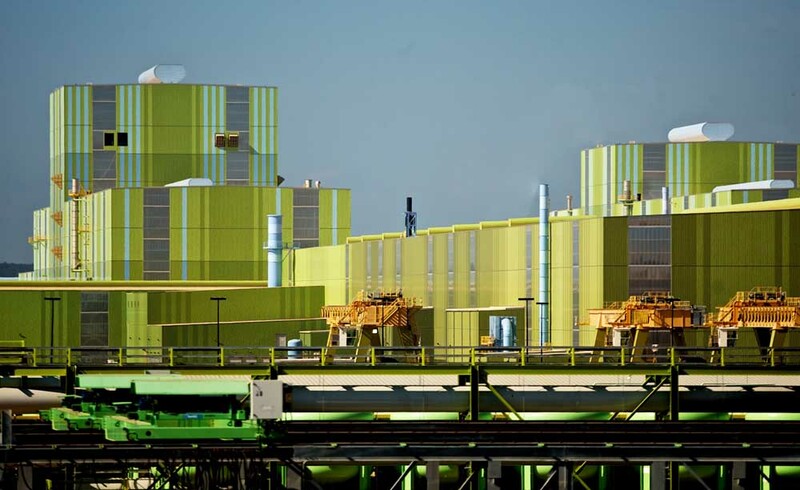 Industrial facilities must provide a resilient and worker-friendly environment to maximize internal activities while delivering a sleek, professional exterior. Our translucent polycarbonate wall systems not only deliver resiliency for harsh industrial activities, but they provide natural daylighting. Daylighting has been proven to maximize worker productivity and have positive impacts on mental health. 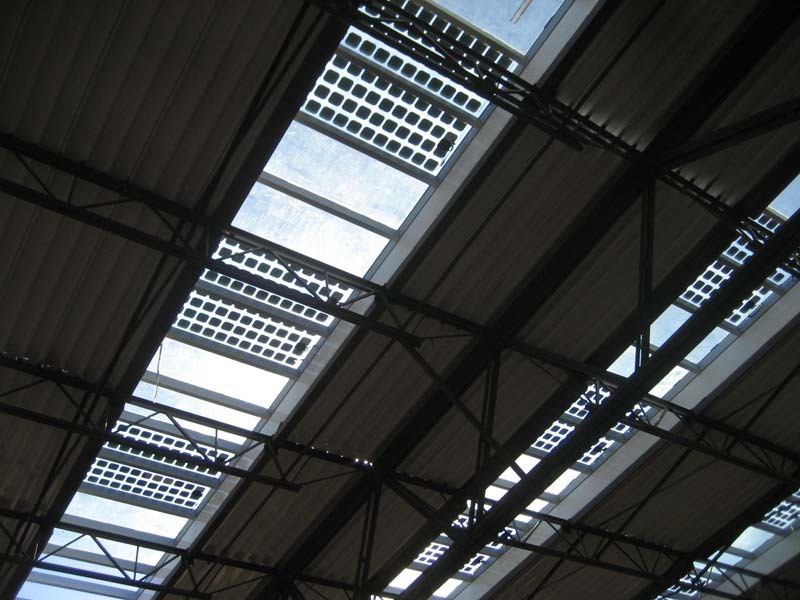 Additionally, daylighting can help lower electric lighting costs for industrial facilities. Though translucent walls permit light to be transmitted, polycarbonate glazing with diffused translucency offers privacy from the outside world. Polycarbonate comes in a variety of colors and translucencies, and can be provided with added diffusion or infrared rejection properties to meet your project needs. EXTECH’s skylight systems offer overhead daylighting and have been used in industrial applications to maximize internal illumination, reduce operating costs, and deliver energy-efficient building upgrades without breaking the bank. Our SKYGARD skylight systems are based around a unique system of overlapping joinery and internal gutters that provide an extremely leak-resistant skylight. Our SKYGARD 3700 system has undergone a complete battery of air, water and structural test, and provides superior performance numbers. The 3700 system can incorporate both glass and cellular polycarbonate skylight glazing to meet your project's specific requirements. 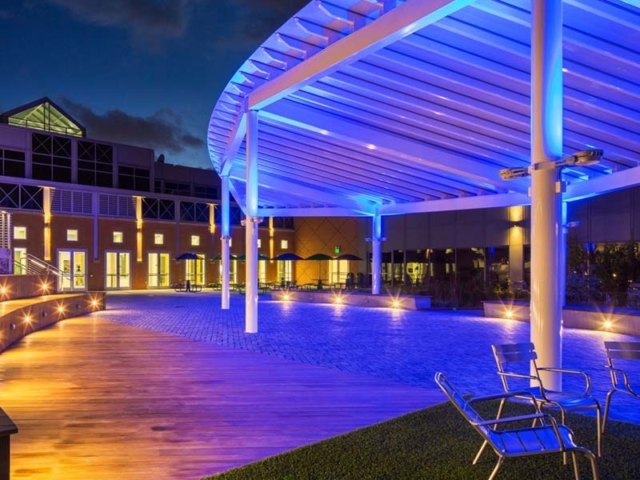 Our SKYSHADE canopy systems are commonly used for covered walkways that connect individual buildings within an organization's campus, material or equipment coverings, or entrance protection. Our SKYSHADE canopies can utilize standing seam cellular polycarbonate, solid monolithic polycarbonate sheets, or flat-sheet multiwall polycarbonate captured by aluminum framing. SKYSHADE systems are designed with lightweight fully-fabricated components that install easily, and can be seamlessly attached or integrated with existing structures. 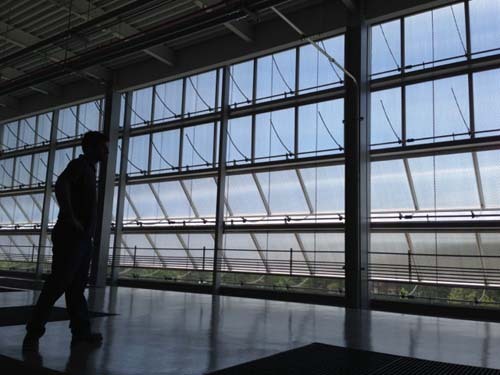 EXTECH regularly performs daylighting studies for industrial applications to ensure we can provide a system that harnesses the optimal amount of daylight, prevents solar heat gain (and a heavy demand on the HVAC system), all while avoiding glare. The key to maximizing daylighting benefits is to partner with us early in the design process while modifications to the glazing layout are still easily made and potential savings in building structure can still be realized. 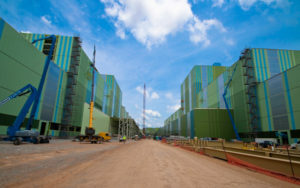 Our engineers simulate industrial designs in a virtual setting that analyzes the orientation of the facility and considers the times of day when internal activities occur. This analysis predicts how much natural daylighting can be realized, and allows architects and lighting designers to decide how much supplemental electrical lighting is necessary. The analysis begins with us entering a CAD model of your building into the analysis software. We then orient the building in virtual space to align with its true site placement. 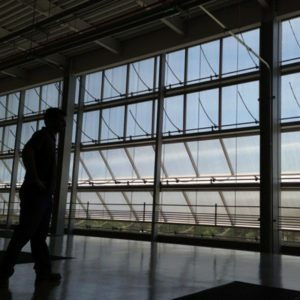 The software then simulates the motion of the sun through the sky, throughout an entire year, and records the cumulative amount of daylighting at various plans of height inside of the building – measured in foot candles. Finally, we enter various glazing layouts and material selections into the virtual model, and repeat the analysis, to determine which options are most beneficial. 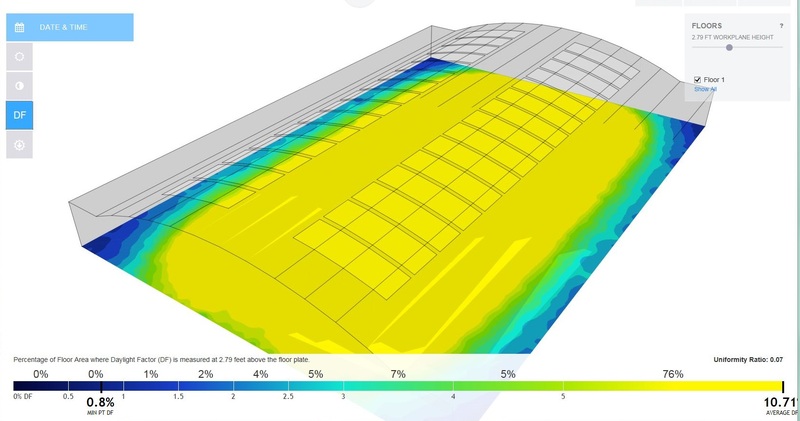 These images represent just some of the output from a typical daylighting study. 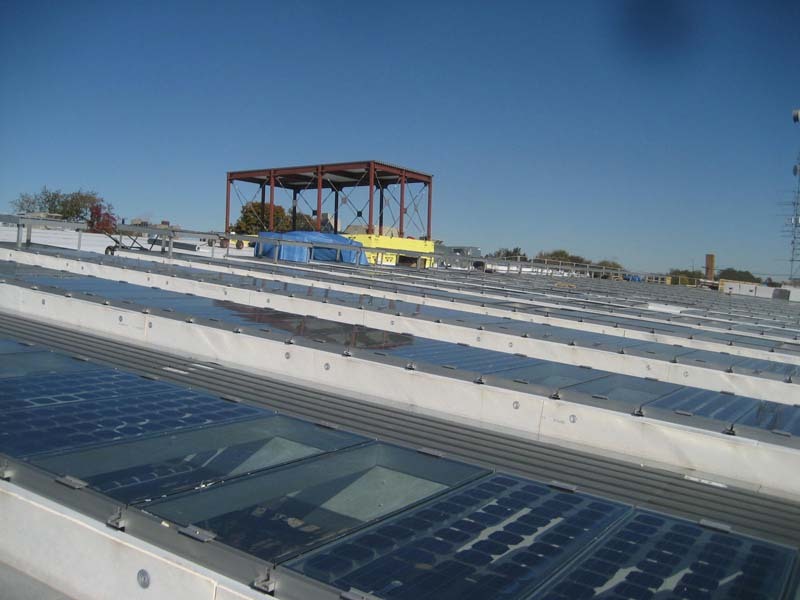 EXTECH’s daylighting systems are built for long-lasting value and a minimal need for ongoing maintenance – this results in long-term cost-savings. 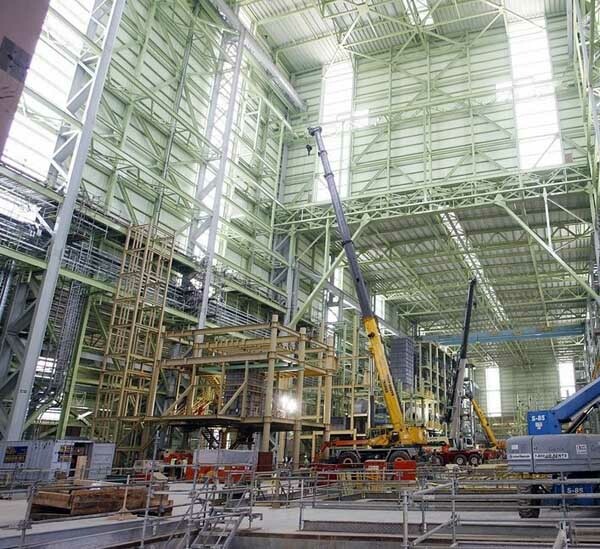 Our LIGHTWALL 3100LS ended up saving 66% on the exterior budget for the ThyssenKrupp Steel Mill (see case study below) due to both glazing material cost savings and the reduced need for supporting structure. Polycarbonate systems are an economical alternative to materials like channel glass because they deliver the same robust resilience and daylighting capabilities at roughly a third of the cost. Our systems are ideal for retrofits because of our in-house engineering design and detailing capabilities – we can easily customize a system to meet your requirements, or solve specific installation challenges. This makes our systems ideal for retrofits and additions to existing structures. 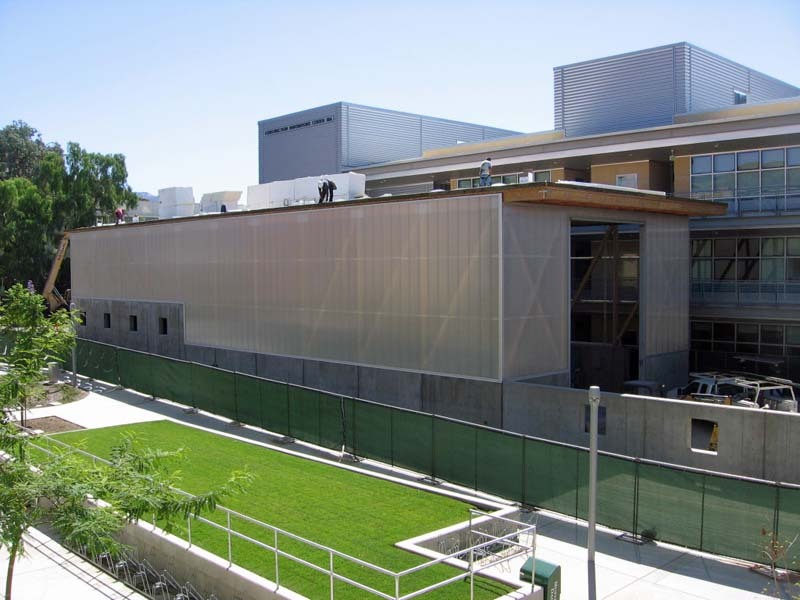 Polycarbonate panels are superior to the Fiberglass reinforced panels (FRP) that have been traditionally used for industrial glazing applications. 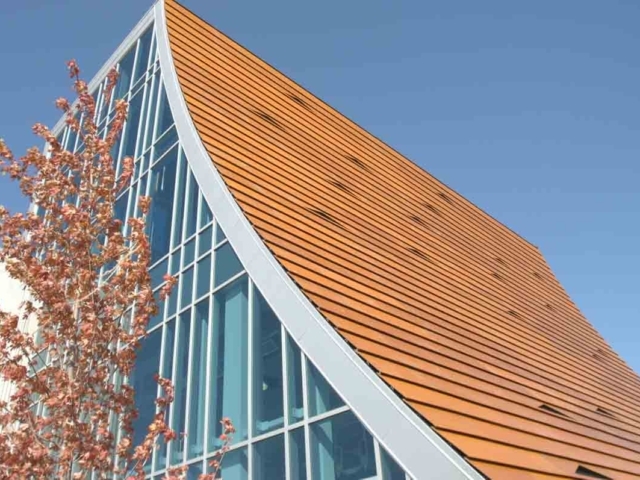 Commonly referred to as “sandwich panels”, FRP products are susceptible to “fiber-bloom,” a common deterioration found in fiberglass caused by weathering and erosion of the fiberglass skin. Additionally, a common warranty requirement of FRP sandwich panels is that ongoing maintenance is performed to maintain the gel-coat of the fiberglass skin. 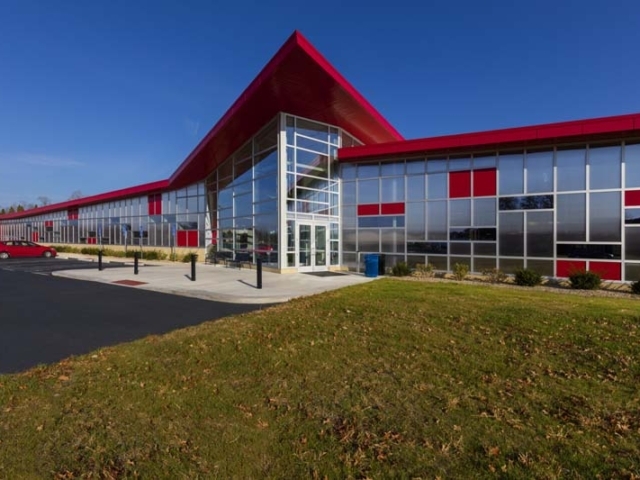 EXTECH’s translucent polycarbonate glazing systems offer a modern, high-performance, and low maintenance alternative to antiquated FRP products. Our engineers are accustomed to helping clients with tight project deadlines. The full fabrication and detailing of our systems, along with the lightweight nature of polycarbonate glazing, makes our systems quick and easy to install. Daylighting systems enable industrial clients to save money on energy costs by incorporating natural light illumination into their facility. Additionally, they provide superior insulating value (as compared to insulated glass units) thus reducing demands on the HVAC system. 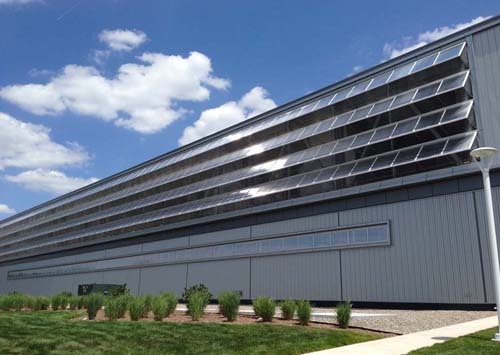 Our systems’ daylighting capabilities and 100% recyclability lend themselves to LEED certification and sustainable industrial design, which are key components in reducing the environmental footprint of manufacturing and storage buildings. Furthermore, we are experienced in incorporating PV solar panels into our systems so that large industrial facilities can enjoy the benefits of their own micro-grid. Additionally, we have worked on various projects that required additional testing to meet rigorous environmental standards, thus we know how to navigate and meet tedious code requirements. EXTECH’s daylighting systems meet industry flammability standards and offer polycarbonate glazing options that carry a Class A fire rating (the best there is). Our engineers and designers are well-versed in various municipal codes, and can walk you through the standards your application will be tasked with meeting. To find out more about EXTECH’s experience delivering systems for industrial applications, see our industrial and warehouse facilities case studies or contact us for more information.